Table H.5. Embodied energy in various walls, floors, and roofs. Sources: [3kmcks], Lawson (1996). Table H.6. Process energy for making a three-bedroom house. Figure H.7. 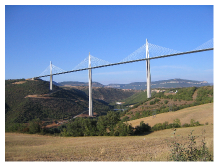 Millau Viaduct in France, the highest bridge in the world. Steel and concrete, 2.5 km long and 353 m high.